Our lovingly restored 19th century home has a comfortably curated vibe with period appropriate furniture and accessories. 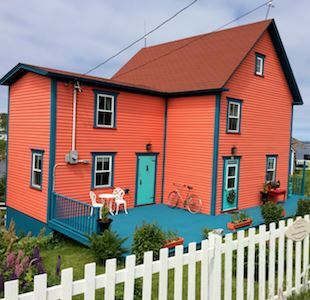 For those looking for an unforgettable Newfoundland outport experience, look no further! The Pumpkin House features three bedrooms, one with a queen bed and two with double beds. All bedrooms are upstairs; one with an ensuite washroom and the main bathroom is located downstairs. The house comfortably sleeps four. On the main floor there's a Victorian style dining room, perfect for an afternoon tea or serving up that jigs dinner you cooked-up in the kitchen. You will find the eat-in kitchen well stocked for your basic cooking and baking. In the sitting room, comfy seating allows you and and your friends to put your feet up and take a load off. Don't let the weather get the better of you and your stay, we have Netflix setup in the sitting room for your viewing pleasure . Outside there is a wrap-around deck with benches and seating; perfect for bird and 'berg watching, catching the sunset or just kicking back and watching the world go by. We rent from May to October exclusively through Airbnb!